Well the book arrived two days ago and I got stuck straight in. Luckily I have a good stock of chatons, because this book is going to munch them up. For choice I would have made the Bubble Ball Pendant first because it’s my favourite, but I had the right beads for Tiles on a Ring so I dived in. 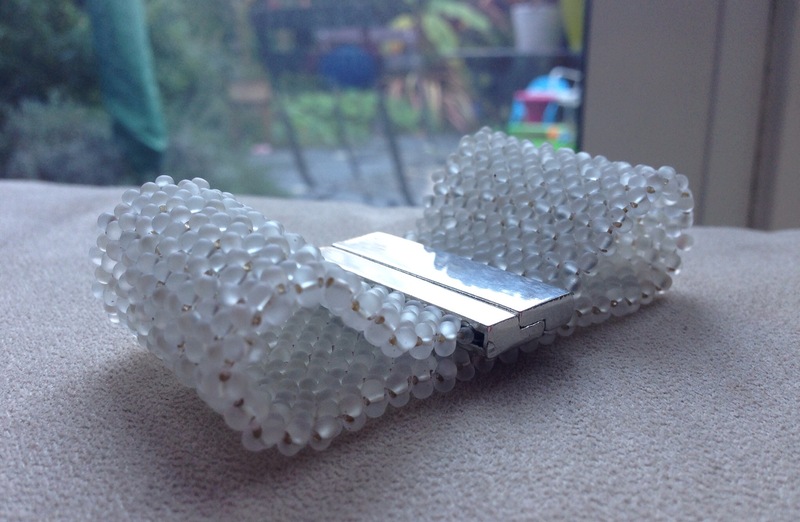 It went together beautifully – Sabine’s designs are always so simple, whilst looking amazingly flamboyant. Around three hours in total, so an excellent weekend project. It uses a RAW base with a 3D netted embellishment to form the cups and frames for the chatons, and I’d say it’s suitable for intermediates. I got the colours wrong – the fire polished beads are too different in colours from the seeds, and because the seeds and the firepolisheds are next to each other rather than used together it makes the firepolished ring look a bit disconnected. A shiny finish might have worked, or blue iris to match the seeds. 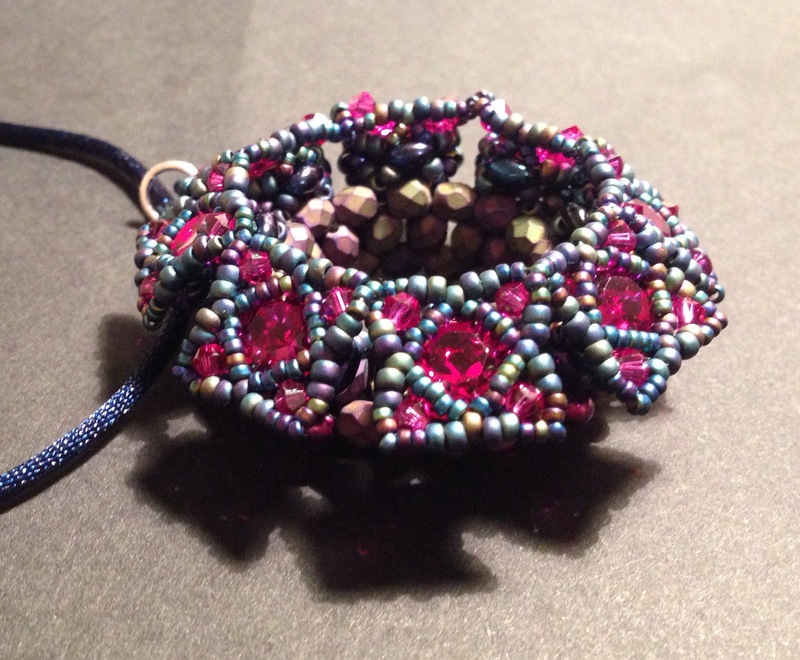 This is a shame as I’d chosen the combination to go with the Baroque Dimensional Bracelet I made a while back. Use the same colour of bicones and chatons – that will give you lovely squares of bling, and you’ll loose those squares if you don’t match them. As with all of Sabine’s pieces a relaxed tension really helps – I have to make the effort to remember this one! At last it has arrived after a frustrating wait …….. And it’s fab! Some very Sabine stuff, and some slightly different stuff so a good mix. Cue a happy evening looking through my stash and choosing what to make first (interspersed with sulks when I don’t quite have the right beads). One of the 3d balls from the last chapter probably, if I have enough chatons. Watch this space. This bracelet is based on lots of pieces I’ve seen around the beading world using plain RAW and farfalles/peanut beads, so although its simplicity (flat RAW – not exactly revolutionary) means I did strictly speaking manage to design it myself, the credit for the concept belongs to others – so if you want a proper pattern head over to Etsy and look at Shelley Nybajke‘s splendid downloads using some bigger lovely etched beads. I bet she isn’t scared of glue. 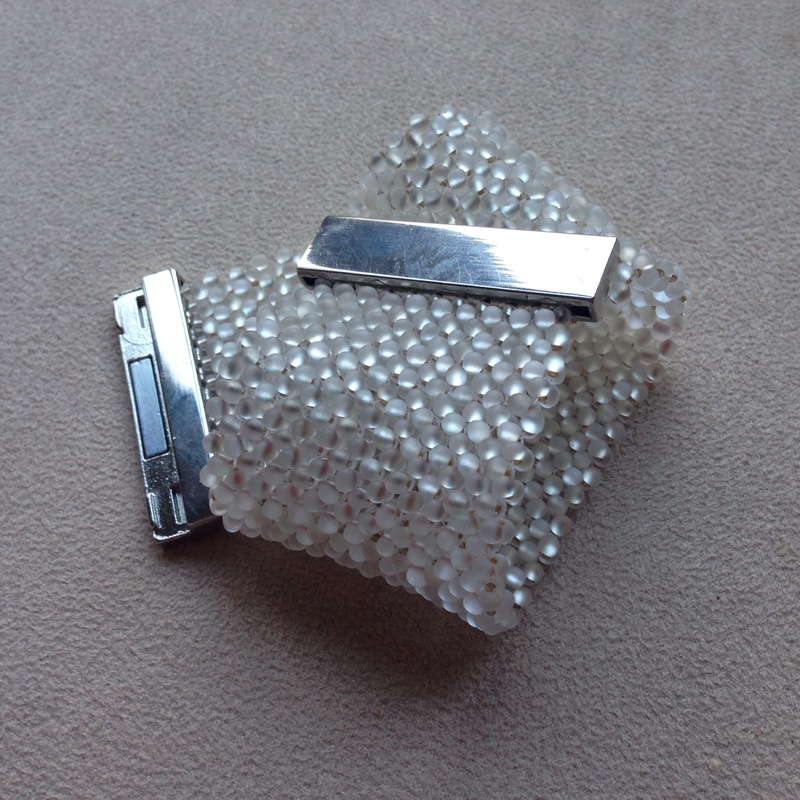 Aurelio Castano has also done some lovely things with similar clasps, and Beading Daily blogged about both of their work (which is what made me order the clasps in the first place). Anyway, it consists of 43 rows of RAW 10 units wide using the farfalles. Then to create a tab to glue into the clasp I sized down using 11s and then did a row or two using pairs of 15s (have a play to see what will fit into your clasp). Use a double length of thread – work with one half, then go back and build out in the opposite direction using the other half. Fasten off and attach a new thread for the 11s as then if something goes wrong with the catch you won’t trash the main part of the beadwork. Next time I’d make this wider rather than narrower than the catch – I just think it will look better. One or possibly two more units per row. I’d also make it a touch snugger on the wrist as it will sit better and not flap around. Two or possibly three rows less (I have a 16 cm wrist – finished length was 19.5cm and I think 18cm would have been better). These clasps were fine to play with, but if you have another source locally I’d go for something a little more expensive as the plating has already started to wear a little. Also the holes on this colour (which looked like they might be useful for glue avoidance) turned out to be a bit clogged up with plating and would have trashed my thread……. Author theindecisivebeaderPosted on November 11, 2014 October 23, 2014 Format ImageCategories UncategorizedTags poppies, tower of londonLeave a comment on Lest we forget…..